With unsanctioned clone maker Psystar still pushing its knock-off Macs in the face of ongoing litigation, another company is testing Apple's legal resolve and treading on its trademarks in the process through sales of a pair of new "OpeniMac" systems. 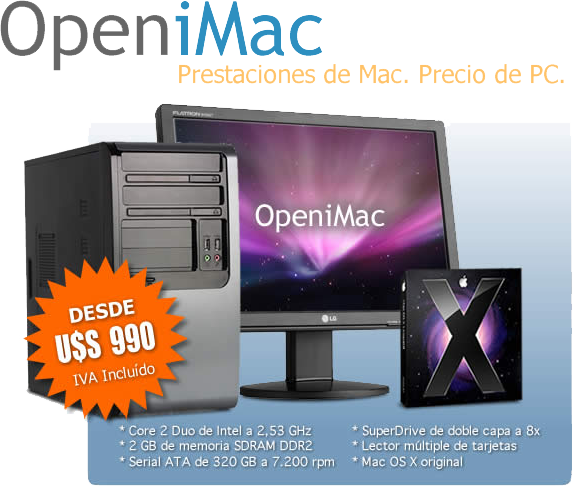 It's not immediately clear who's behind the latest effort spotted by Engadget, but the Argentinean-based dealer has dubbed its systems the "OpeniMac" despite their lack of an all-in-one design. It's also constructed a snazzy website to promote them. For $990, the dealer is offering a 2.53GHz "OpeniMac" with 3 MB of shared L2 cache, 2GB of DDR2 SDRAM, a 320 GB Serial ATA 7200 rpm drive, an 8X SuperDrive, and an ATI Radeon HD PRO with 256 MB of video memory GDDR3. Another $340 will get you a 19-inch LG LCD display to go along with it. A high-end offering, conveniently called the "OpeniMac Pro," is priced at $1710 and comes with a 3.0 GHz Intel Core 2 Duo with 6 MB of shared L2 cache, 4 GB of DDR2 SDRAM, a 500 GB Serial ATA 7200 rpm drive, an 8X SuperDrive, a NVIDIA GeForce GS with 1 GB of GDDR3 video memory, and "a brilliant" 20-inch LG widescreen display. The OpeniMac website even takes a swipe at the performance of Apple's systems, displaying a series of benchmark graphs comparing the company's official offerings to their unauthorized alternatives. Last month, a California judge threw out Psystar's countersuit against Apple, leaving the Mac maker free of opposition in pursuing charges against the clone maker that include trademark and copyright infringement. This week, Apple added a new charge and contested in court documents that it believes Psystar is part of a larger plot with some bigger names pulling the strings.